My doorbell rang this afternoon. It was my cheerful postman, Kevin, and he had a certified letter for me. Certified letters are almost always buzzkillers. I could see from the envelope that this one was from the NYC Dept of Transportation so I knew it wasn't congratulations from Publishers Clearinghouse. Kevin said that every house on the block, except one, got certified letters from DOT. What the hell, I've got nothing to be concerned about My sidewalk and curb are in excellent condition. I signed for the letter and opened it up. Inside was a Notice of Violation that my sidewalk had been inspected and was found to have a "trip hazard". The notice said that I needed to replace ten square feet of sidewalk. There was a graphic indicating this general section of my sidewalk. In NYC -- and I presume that this is the case in most large cities -- the building owner is responsible for the condition of his sidewalk. If a sidewalk falls out of repair it's the homeowner's job to repair it, just as it's his job to keep it clean and clear of snow. However, enforcement has typically been limited to third party complaints, not proactive inspections. I'm told the city is named in tens thousands of predatory civil suits every year related to substandard sidewalks, some of them pretty funny... like the guy who tried to sue my neighbor for "loss of marital congress" after he allegedly tripped on a crack on the sidewalk and broke his pinkie finger. I swear I'm not making this up. Last year around this time, a non-DOT crew, which I presumed to be an independent contractor, was tearing up and replacing sidewalks all over the neighborhood. It was the same sort of thing: an anonymous inspector had run around the neighborhood tagging damaged sidewalks for repair. Certified letters were sent to homeowners with vague indications of the nature of the violation. They were given 45 days to either apply for a permit and get the job done by a licensed contractor or the city would do the job @ $9+ square foot and bill the homeowner. The thing is, I walked those sidewalks several times a day. While a few of them did have some issues with tree roots, most of the sidewalks that were replaced I remember as being in fine shape. At least, I never saw an issue with them. The entire process struck me at the time as being somewhat arbitrary, which is to say fishy. And now here we are again. 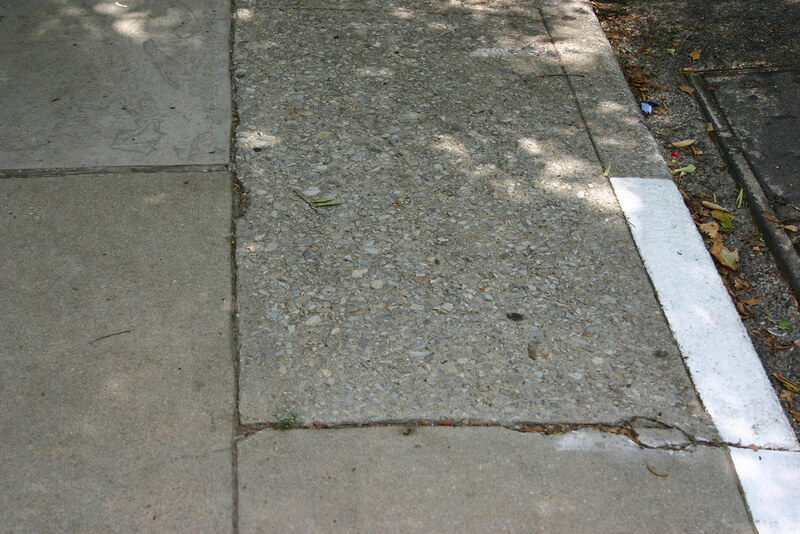 What I see is a somewhat ragged sidewalk seam with a small piece of concrete that's not loose or in danger of falling out any time soon. Whatever, that's not the noted violation anyway. If it was it would have been tagged with Defect Code #1: "broken". Instead it indicates a Defect Code #3: "trip hazard". Is it the little protruduing weed on the left? This seems REALLY shady to me... but I am curious - is $9/sq. ft. a bad price to pay? We just had one of our squares done out front and it was $135. I thought the price seemed pretty reasonable. I'm estimating that maybe that square was about 9 square feet... Hopefully you can get to the bottom of it. I'm sure these concrete repair companies have gotten good at "making complaints" so that the city drums up business for them. Yeah, you know? If I could find a licensed contractor willing to do a job this small it would probably be at least $500. Neverthless, I'm going to file a Sidewalk Violation Reinspection appeal tomorrow. This is done by a different inspector who (according to the DOT literature) doesn't have access to the original inspection report. What I suspect is that DOT lets the contractor's "inspectors" do the initial inspections. That's the only thing I can't think of that explains why even houses which have had their sidewalks replaced in the last five years were given violation notices. With the square foot price so low I imagine that most homeowners don't even bother complaining. I just got one also 2/2012 in Marine Park Brooklyn. How do I pick someone reliable? And isn't it harmful for the tconcrete when its still do cold? What is a fair price per square? Has anyone gotten the permits on their own? Do I have to notify the utilities? Are you looking to sell your house soon? If you're planning on staying, the city will send a crew to do the fix for $9 square foot... although that could be ten years from now. That's actually not a bad price given that the city would also be responsible for filing the permits and passing its own inspection as well as dealing with Parks over any tree roots issues. But if you have to tear up and replace an entire sidewalk rather than just a cracked flag or two it might be cheaper to get your own licensed contractor. I met the DOT inspector when he was measuring on the block. He said that there had been a complaint by a resident on the northeast side of our block and that, once there was a complaint, the whole block had to be checked. Perhaps his citing all of us was his way of saying that the complaint was frivolous and that we should all appeal. That's interesting. There are a couple of genuine trip hazards on the block. You can request a re-inspection. The consultants that do the mass inspections have been historically very troublesome. Nothing really bad happens if you don;t fix it. IF there was a contractor there last year doing lots of sidewalk, they... likely will not be in your area again for a long time. A sidewalk violation does not create a lien. Unpaid sidewalk work, which is billed through the dept of Finance, is potentially lieanable. But definitely get a reinspection. The reinspection is supposed to be done by a different inspector who is not supposed to look at the previous inspector's results. Also if the city does the work, you do not have to take a permit, and the warranty is pretty good. So waiting is not a bad thing. As for the defect, DOT website should have the rules about conditions, and nearly anything can be a defect. Frankly, yes I see what meets the definition of sidewalk defect there (having spent quite a few years working with the sidewalk people). The little broken bit in the corner, the small cracks, the pebbly bits, and the slight differences in ...the heights of the flags probably meet the legal definition of a trip hazard. A huge portion of the city's sidewalks meet that definition. 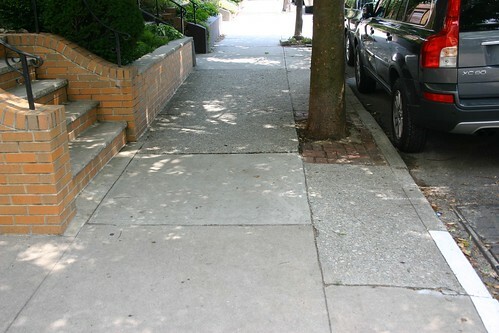 Your sidewalk doesn't look egregious, but there's enough that if an inspector were dispatched there, he'd see something and have to write a violation. As far as what to do, ask for a reinspection. At a minimum, you'll probably get the area reduced. There's a further wrinkle that because yours is a single family home, you might not be liable for the repair. Go to nyc.gov, navigate to DOT, and follow the sidewalk links. That should tell you what to do. If you can't figure that out, send me an email, and I'll give you a hand. yep i see it, it's over there on the right... oh wait that's the curb. stupid dot. I just got a letter today August 21, 2010 delivered to me in the same fashion. As I was reading your statement, I felt as if I wrote it myself. Funny thing, I do recall those inspectors all over my block. We couldn't help wondering what the buzz was all about. Well now we know. I haven't taken a poll yet with my neighbors to see who got one and who didn't. I am still dumbfounded. I purchased my house 5 years ago and one of the high hats was that the roof was recently redone, siding, and the concrete around the entire perimeter of the house! The sidewalks are relatively new! So what are they talking about. The letter states it was issued on July 30, 2010 and I got it August 21, 2010. Supposedly you have 45 days? I think this whole thing is a city scam. I live in Staten Island. If I walk down my block there are areas that have their sidewalks being uprooted by these huge trees. Our sidewalk is in fantastic shape and they want us to do 40 sq ft over! Yes, I got the same diagram drawing out the property. I want somebody to physically come and point out this defect. This is crazy! You can call 311 and request a reinspection by DOT. A friend at DOT told me that the soonest we would see a sidewalk repair crew is ten years from now, which is consistent with what the oldtimers around here told me about the DOT repair crews that hit the neighborhood last year. He also told me that if you have a legitimate violation that it's cheaper and less hassle to just let DOT do the repair. That way they're responsible for the permit and inspection too. That curb must be the tripping hazard! You need to make a ramp there. It really is crazy the way the city operates. To my eyes, it appears fine. I cant imagine the whole entire block having the same issue. Maybe they just want everyone to have new sidewalks. In my case the sidewalk slab to be replaced had a bit of character to it...there was gravel mixed in to give it a textured finish. Rather than have the city just pour a clean slab that would look obviously different I repaired mine with a private contractor. The kick in the head is that when the inspector came around again to clear the first violation HE FOUND ANOTHER ONE. So I did it all again. In short as long as the sidewalk violation is on the property there is a cloud on title and it cannot be sold. Maybe 40 years ago my neighbor replaced his sidewalk with a mix containing large aggregate stones. For some reason, about ten square feet of it was a slab across my property line. You can sorta see it in the photo. The DOT reinspection upheld the original finding. I was told that the concrete wasn't in compliance with city code at the time because it allows standing water to pool and freeze, hence the "trip hazard" determination. So I let the city repair it because there was no way I could get a private sidewalk contractor to do that job for the same ninety bucks. Curiously, that was two years ago but I've not been billed for the job.